Join K-12 and post-secondary education leaders in Mindshare Learning’s annual summit to help sustain and raise Canada’s leadership in EdTech. 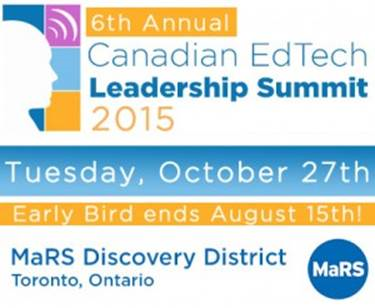 The 6th EdTech Leadership Summit theme is Redefining the Canadian Digital Learning Landscape, which will explore getting beyond pockets of innovation in our digital age. The notion of ‘mindsharing’ with leading Canadian education and industry thought leaders creates powerful opportunities for collaboration, innovation and the forging of unique partnerships. Gain deep insights on EdTech trends through the Cross Canada Checkup expert panel, which includes industry experts from Surrey District School Board, B.C., Queen’s University and Lambton Kent District School Board, ON, President and Chief Executive Officer of Contact North, the CEO of FreshGrade, an EdTech start-up, and much more.